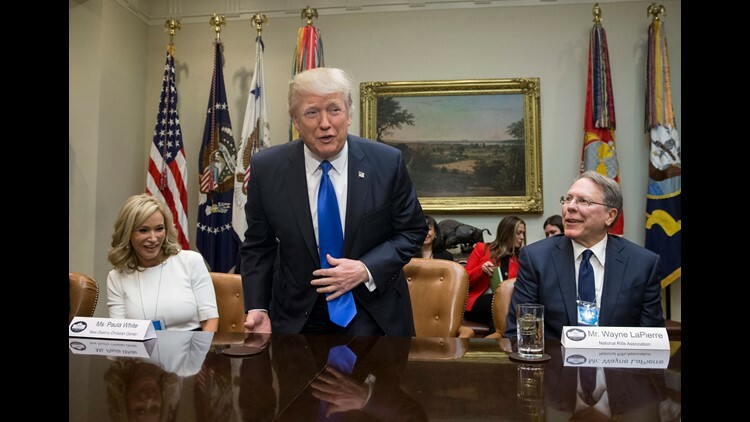 Trump takes his seat between Paula White of the New Destiny Christian Center and NRA Executive Vice President and CEO Wayne LaPierre at a meeting on his nomination of Neil Gorsuch to the Supreme Court in the Roosevelt Room on Feb. 1, 2017. A spiritual adviser to President Donald Trump said that Jesus would have been "sinful" and not "our Messiah" if he had broken immigration law when fleeing persecution as a baby with his family. "I think so many people have taken biblical scriptures out of context on this, to say stuff like, 'Well, Jesus was a refugee,'" White told the news outlet in an interview published Monday. "And yes, he did live in Egypt for three and a half years. But it was not illegal. If he had broke the law, then he would have been sinful and he would not have been our Messiah." White also praised the care for the children at the center, saying they received "three square meals" as well as medical and psychiatric care, among other amenities. Her comments concerning Jesus' immigration status refers to Mary and Joseph's flight to Egypt after their son's birth. King Herod, fearful of Jesus, announced his intent to kill all newborns in Bethlehem, as recounted in the Gospel of Matthew. Jesus' family stayed in Egypt until Herod died, according to Matthew. However, Matthew Soerens, national coordinator for Evangelical Immigration Table, cast doubt on White's logic about whether Jesus could have even broken an immigration law in the first place, telling HuffPost that there's "no reason from the text to think that (Jesus') parents requested refugee status in advance of their flight." "Much like many Salvadoran or Honduran families today who are fleeing gang violence, their response to a credible threat to their family's safety was to try to reach a foreign country where they would be safe, protected from those seeking to do them harm," Soerens also told HuffPost. Calling Jesus a refugee has been a popular refrain among some faith groups in response to policies — like President Donald Trump's "zero tolerance" policy — that seek to toughen national immigration enforcement. During his Christmas Eve mass last year, Pope Francis compared Mary and Joseph's journey to those of many migrants fleeing their homes for survival or a better life. "So many other footsteps are hidden in the footsteps of Joseph and Mary. ... We see the tracks of entire families forced to set out in our own day," Francis said in December. "We see the tracks of millions of persons who do not choose to go away, but driven from their land, leave behind their dear ones." Under Trump's "zero tolerance" policy to criminally prosecute anyone crossing the border illegally, more than 2,000 children were separated from their parents. Before Trump signed an executive order that aimed to end family separations, Francis told Reuters in June that he supported a statement by U.S. Catholic bishops calling the practice "contrary to our Catholic values" and "immoral."